A rising force, now the world's second-largest economy, China predicted that America's decline would be slow and inevitable, the ebbing of one global power and the ascent of another. [post_ads]But that process may be accelerating as President Donald Trump wobbles on long-standing commitments to Japan and South Korea, and calls for shrinking the U.S. military presence in the region — even as China is flexing its economic, military and political muscle from Sri Lanka to the South China Sea. Secretary of Defense James N. Mattis, who met with Chinese President Xi Jinping on Wednesday in Beijing, emphasized U.S. concerns about China's growing militarization of scattered islands and shoals in the South China Sea. Other nations also claim the islands, and the maritime and territorial disputes with Beijing have roiled the region. China argues that the runways, missiles and electronic jammers it has installed are for defensive purposes, and Xi made clear Beijing will not back down. "Not one inch of the territory left by our ancestors can be lost," he told Mattis, according to the official New China News Agency. Mattis' visit came after the Pentagon disinvited China's military from a major naval exercise in the Pacific, a snub meant to protest the island buildup. This year, the Pentagon issued a national defense strategy that described China as a primary challenge to U.S. security, noting its planned construction of aircraft carriers, a growing arsenal of ballistic missiles, increasingly advanced aircraft and a growing capability in cyberspace and outer space. "The Chinese are celebrating the reduced influence of the United States," said Bonnie Glaser, senior Asia adviser at the Center for Strategic and International Studies, a nonpartisan think tank in Washington. "Even the way the president is talking about pulling troops out of Korea — this is music to China's ears," she said. "It is allowing the Chinese to successfully position themselves in the region in a way that they were not doing before." 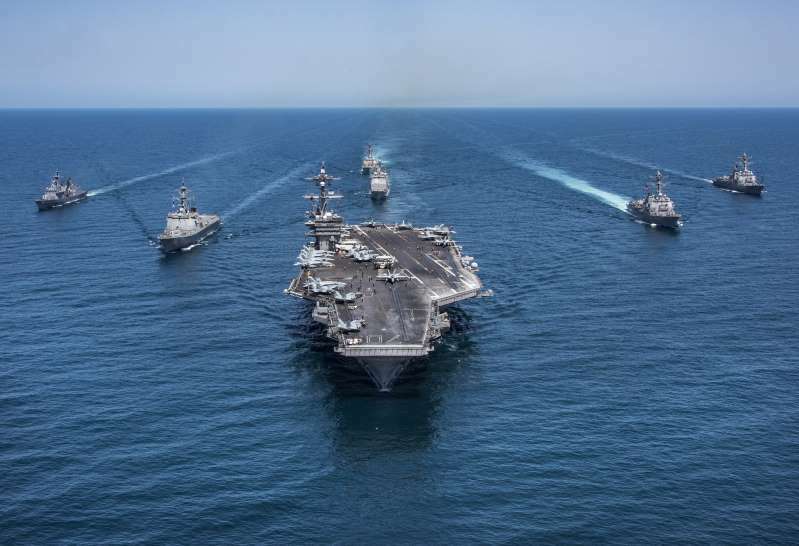 Trump's June 12 summit with North Korean leader Kim Jong Un, and the president's surprise decision to halt U.S. military exercises with South Korea, may augur diminishing American engagement in northeast Asia, long seen as crucial to regional stability and prosperity. Although Beijing was not at the table, it flaunted its influence by flying Kim to Singapore in a clearly marked Air China plane. Kim has met three times with China's president since the summit was announced in March, a sign that China will not allow North Korea to strike a deal with the United States behind its back. What promises to be protracted negotiations over North Korea's pledge to work toward denuclearization will maximize China's influence "at a time when China is confident that its regional power in Asia is increasing while that of the United States is declining," said Robert Daly, director of the Kissinger Institute on China and the United States, a nonprofit research organization in Washington. But Trump's announcement that he was suspending U.S. military exercises with South Korean forces, partly in response to Kim's previous pledge to stop nuclear and ballistic missile tests, gave China a diplomatic victory that it long had sought: a "freeze for a freeze" as the basis for future negotiations, a position previous U.S. presidents had rejected. Trump even adopted China and North Korea's language, describing the drills as "war games" and "provocative." The Pentagon describes the exercises as defensive in nature and in keeping with America's treaty obligations to help defend South Korea in case of attack. Those comments have sown doubt and unease in Seoul and Tokyo. So has "Not our neighborhood," the phrase Trump used when he vowed that Washington would not foot the bill for rebuilding North Korea. "When he said, 'Korea is not in America's neighborhood,' he played right into Chinese strategy and directly contradicted the long-standing global policies of the United States," said Daniel Russel, an assistant secretary of State for East Asian and Pacific affairs in the Obama administration. "Hopefully, this is a historical blip," said Michael Green, author of a recently published history of the United States in the Pacific. "If we pull out of Korea, we are basically giving China 60 yards on the field for free." Trump's talk of a retreat from the Pacific contrasts with the Obama administration, which in 2012 announced a so-called pivot to Asia and began adding warships and troops to Guam, Australia and elsewhere in an effort to bolster regional allies nervous about Chinese expansion. While the Trump administration considers pulling back, China has gotten far more deeply involved in the region, pledging $500 billion for infrastructure projects in nearby countries through development programs such as its Belt and Road Initiative. Polls have shown wavering support among the American public for keeping U.S. troops in South Korea. Even some Pentagon officials have privately raised doubts. "It is not public. It is not explicit, but there is also within the Pentagon a line of thinking that since 9/11, the military is so overstretched," Green said. "The troops in Korea are a real target for these people." [post_ads]Bruce Cumings, a University of Chicago historian often described as the left's leading scholar on North Korea, offered rare praise for Trump's outreach to Pyongyang. "Trump is winging it on a number of issues, but when it comes to North Korea, he has a fresh eye," Cumings said. "He can look at Korea and question why we are spending billions of dollars to keep our troops there." In the run-up to the Singapore summit, they said the troops would be welcome to remain in South Korea as long as the United States dropped its hostile policy toward North Korea. It has been the Chinese, not the North Koreans, who were most insistent that the U.S. cancel the war games, according to analysts. "For more than 20 years, North Koreans have secretly told Americans that they don't want them to leave the South. This is their guarantee against great power depredation whether from China or Russia or Japan," Cumings said. "They feel that the U.S., being powerful and on the other side of the Pacific, is a good friend to have, whereas those around their own borders are not trustworthy." Carl Baker, a retired Air Force officer and director of the Pacific Forum CSIS in Honolulu, says Trump may be acknowledging a reality that other politicians have been loath to admit: that the U.S. presence in the Pacific is not sustainable over the long term. "I see it as a portent of American decline," Baker said. "The United States is losing influence, and we have to recognize that we can't act with total impunity any longer. ... Trump is just a symptom of this broader issue about the perseverance of the U.S. presence in the Indo-Pacific." "The United States seeks to maintain a free and open Indo-Pacific region," Randall Schriver, assistant secretary of Defense for Asian and Pacific security, testified last month to a Senate committee. "As the region's population and economic weight grow, and as it faces rising security and political challenges, the U.S. commitment to the region must keep pace," he said.